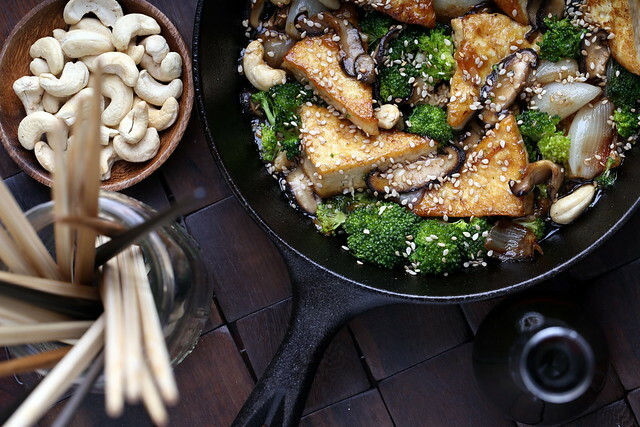 In this dish, well-seared tofu, cashews and crisp vegetables are doused with a sweet and sticky sauce in a cast iron pan, producing something very similar to Chinese takeout. What makes this sauce so beautifully flavored and thick, and allows it to cling so well to the tofu, is a simple and small dash of a cold water and cornstarch slurry added at the end of cooking time. This looks and smells heavenly throughout the prep and cook time, and is quick and easy enough to make as a weeknight dinner. Combine all of the sauce ingredients except for the cornstarch and water into a small bowl and set aside. In a cast iron pan, heat the olive oil over medium-low heat. Add in the ginger and garlic and allow to soften for a minute or two. Then, scrape the contents into a small bowl and set aside. Return to the stove and place a little more olive oil into the pan. Increase the heat to medium, then place the tofu triangles into the pan. Be careful, as the pan may sputter a bit. Allow the tofu to brown on one side for about 6 minutes, then flip and allow the other side to brown for the same amount of time. Transfer the tofu to a plate. Next, add in the shallots to the pan. Poke them around a bit after a minute to allow the layers to separate. Add in the mushrooms, stir, then deglaze the pan with a tablespoon of water. Allow to sizzle for a minute or two, then toss in the broccoli florets and cashews. Once the broccoli is bright green after a minute or so, transfer the pan contents to another plate. Now return the tofu to the pan. Whisk together the sauce, then pour it over the tofu. Stir gently to combine. Stir the water and cornstarch together in a small bowl until combined, then pour into the pan, stir and allow to slightly thicken, then remove from the heat immediately. Place cooked noodles or rice into a bowl. 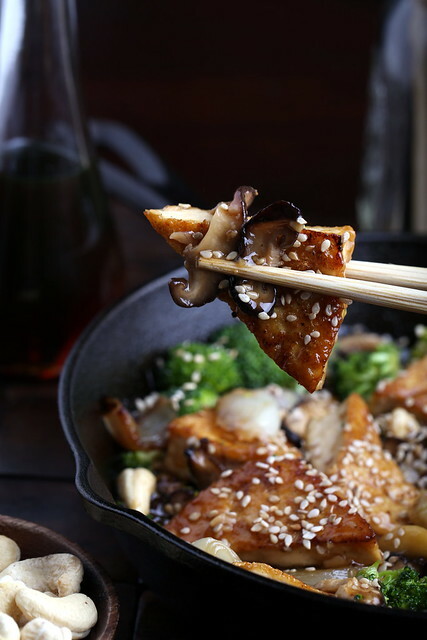 Add the vegetables and other reserved components to the bowl, then place the tofu triangles over everything, using a spatula to scrape any leftover sauce out of the pan. Sprinkle with the sesame seeds, then serve immediately. Hi Erin, This photo and recipe made me want to make it right now – maybe with a fried egg on top so I can call it breakfast! I just started blogging a couple of weeks ago and your site is an inspiration. I am working on formatting mine so it's not so f-ugly, and my photography is strictly amateur but I couldn't wait to get started. Let me know what you think if you get a chance? this is perfection. I learned the cornstarch-water thickener trick from my mom when I was a kid – and do not use it often enough. I cannot wait to try this recipe. WOW! I just stumbled across your blog, and already, I am absolutely astounded. You're so talented! P.S. Your vegan faux-roe and sriracha pearls astound me. Wow. Looks lovely and sounds tasty. I made this recipe last night. I did make a small change and added the juice of an orange and a bit of orange zest to really brighten up the flavor. I always look forward to your recipes! Vegan here. I'm not a big fan of soybeans/tofu–but this I will try! Get in my face now delicious meal! I just made this for dinner, am about to sit down. The sauce is like a savory caramel. Delicious–thank you! I made this for dinner last night with soba noodles. It was so good. this was absolutely delicious! Thank-you so much for sharing! Can I use tempeh, instead of tofu? yes, I think tempeh would work great here! I have made this recipe a couple of times and LOVE IT, but do have a question for you, Erin. I don't cook with alcohol for religious reasons. What do you suggest as a replacement for mirin? If you don't want to use a water/sugar mixture, you can also try white grape juice as your base, then add in rice vinegar to taste, one teaspoon at a time. Good luck! You can use rice wine vinegar and sugar as a substitute, about to make this for dinner, few more veggies I cant wait, yum yum. I made this last night. WOW! I was so surprised as this was excellent restaurant quality. My husband, a non-vegan, hates tofu. He did like the look of the dish and said he’d try a plate with my 15yr old son and I. He scoffed his entire plate clean! Needless to say, my son, who’s a tofu hound, and I REALLY enjoyed this meal thoroughly as well. Will be making this often. One question: Could I bake the tofu instead of frying? If a non-vegan who despises tofu can lick his plate clean with this dish then it certainly deserves a full-star rating! Thanks for an awesome dish!! Trish, I love your comment so much! Thank you so much for sharing and I’m thrilled that it was a hit! Delicious!! Will definitely make again. This is my favorite recipe from this site, so far! I’ve made it for company who had never had tofu before and they were converted.